You’ve got a lot going on this time of the year. That makes every day off precious. Even if you just need to take that day to regroup, then you don’t want to have it bogged down by an endless list of chores. Yes, some things need to get done in order to make your home ready for the holidays but it doesn’t mean you have to do it all. That is especially true when it comes to heavy yard debris removal. That is a task that the best turned over to a company like Junk King Miami. One call to these junk hauling experts and that heavy yard debris can be gone today. Junk King Miami always leaves room in their schedule for same day pickups. Sometimes customers aren’t always ready to get their stuff removed in the same day. Junk King can make accommodations to schedule for weekend pickups or late in the evening. It’s all about what works best for your schedule. Of course, if you are dealing with heavy yard debris removal, then it’s a good idea to try and schedule your appointment during the day so everyone can see exactly what needs to be cleared out. The truck that Junk King will send over will be big enough to hold whatever you want to get rid of. The goal is to get everything loaded and carted away in a single session. Once the crew arrives they’ll size up all the things you want to get rid of and provide you with an estimate on how they going to pack up that stuff. It could take up one-third, one-half or the whole truck bed. Whatever they determine will become your fee. It will never be a charge by the pound. That really isn’t a fair way to handle this type of work. And it would cost a small fortune if you were getting rid of things like chunks of concrete, bricks and pavers. 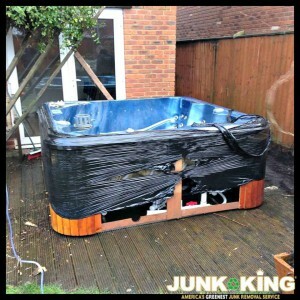 Along with all the heavy yard debris you want to get rid of, Junk King can also make fast work of clearing out things like an old couch, television or washing machine. Take care of your heavy yard debris removal and junk hauling needs by turning that job over the Junk King Miami to day. This entry was posted in Miami Yard Waste Removal and tagged heavy yard debris, jjunk King, junk removal on November 30, 2017 by Junk King. Last updated December 3, 2017 .